The defeat to Aberdeen in the Scottish Cup quarter-final replay was a big blow to the club. It wasn’t a result that really surprised me. Aberdeen had already beaten them twice in Glasgow and the way they line up, sitting in and hitting on the break, is difficult to play against. The formation Rangers use, a 4-3-3, doesn’t always work against a team that’s sitting in. 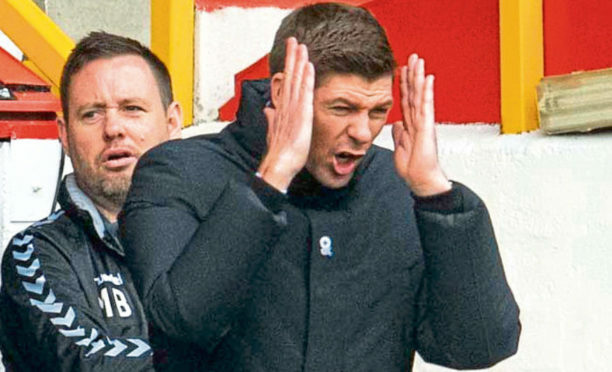 Gerrard is still learning about management and about the game in Scotland. I still believe he is a first-class prospect as a manager. But sometimes you have to learn from bad experiences before you can move forward. Making mistakes isn’t always the worst thing – that’s when you get the biggest learning curve. Aberdeen produced an aggressive display against Rangers and other sides may look to use a similar approach. That emphasises that players with an inner steel to stand up and use their physicality need to be brought in. Rangers already have a lot of good players, but it seems Gerrard accepts more quality is needed. And they have to be men with the right mentality. Gerrard will need backing from the board as he searches for a team that can consistently deliver victories. Of course, you need a squad to cover for injuries and suspensions, but Gerrard’s first picks haven’t always done the job. There have been one or two curious examples of team selection. For example, Rangers have never suffered a domestic defeat when young Ross McCrorie is in the side. It could be a question of fitting him into the system favoured by Gerrard. He strikes me as someone with the winning mentality needed at the club. I experienced what it was like to play under the pressure of having to win every match when I joined Rangers in 1977. Before, when I was playing with Kilmarnock, we could suffer three defeats in a row without it being a crisis. The fans expect victories – home and away – regardless of the opposition. And that’s not something that’s easy for players who arrive from England or other countries. I saw what it was like from another angle when I left Rangers. It was early in my time with Brighton when we were on the team bus heading to a game against Ipswich. I remember one of my team-mates saying: “We’re not going to win today”. I asked him what he meant, and the response was that we just never did well there. That was an outlook that was totally alien to me. I’d spent three years with Rangers looking to win every game. Jock Wallace used to say to me that ability was only one aspect you need at Rangers. He maintained that character was also required, players who could stand up and be counted. You can’t do too much homework when it comes to looking at potential signings. Players might look good in their home league, but you have to ask if they can cope with the relentless demand to win every week. It’s not a precise science but you need to do all you can to get the right mix of talent and determination. You need players able to produce 100% of their capabilities even when things aren’t going well. The reason I think Gerrard will eventually bring success to Rangers is that he was the type of character I’m talking about. You only need to look at Liverpool’s 2005 Champions League Final victory against AC Milan in Istanbul. They were down 3-0 at half-time but he played a real captain’s role by scoring the first goal to inspire a comback. That’s a sign that he is a winner.